May-ham on the streets of Indianapolis!!! INDIANAPOLIS, Ind. – Several southbound lanes of I-65 near downtown are closed near West Street as you head toward the North Split because of an overturned semi. 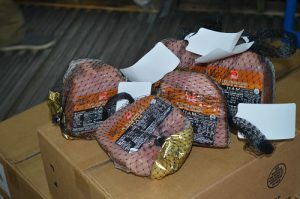 The semi was carrying 40,000 pounds of Hormel ham products. There is no time frame for when all lanes will reopen because another truck needs to be brought in to off-load the ham before they clear the scene. Police say it’s going to be a while. RE: May-ham on the streets of Indianapolis!!! The Marion County Health Department says the food has been “condemned,” and it will all be thrown out. We saw crews tossing it into dumpsters. The crash happened around 2:30 a.m. The driver was transported to Eskenazi Hospital with minor injuries. To good for homeless folks? I think it's considered road kill now. Get out there and help clean up! I am sure there is nothing wrong with most of it. it was probably smashed and nasty from the accident.